CHICAGO, IL The weather was cold and gray but the Chicago Force didn’t seem to mind as they took the Indy Crash by storm in a 62-7 beat down at Lane Stadium. The win propelled Chicago to a 4-0 record and another division title – the fifth in a row for the franchise. The Force offense was led by quarterback Rachel Gore who was named the Offensive Game Day MVP, as she had a hand in all six of the offensive touchdowns. Gore threw for 4 touchdowns – two to Jamie Fornal and one each to Jill Airaki and Jeanette Gray - and rushed for 2 touchdowns as well. Gore amassed 288 passing yards on 16 completions in 22 attempts. The other two Force touchdowns were provided by the swarming defense with Fornal and Melissa Nelson each returning an interception for a score. Fornal was named the Defensive Game Day MVP for her 6 tackles and pick six. 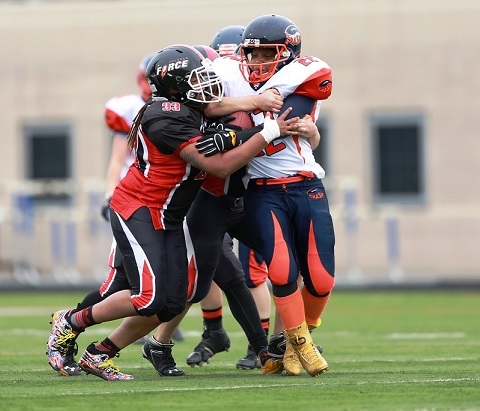 This Chicago defense is developing a reputation for physical play and an aggressive attitude. They yielded just 57 yards from scrimmage and only one pass completion while delivering multiple thunderous hits. The most challenging part of the regular season schedule lies just ahead as the Force face the KC Titans on 5/16 before taking on the defending national champion Boston Renegades on 5/30. Both games are intense rivalries and present the greatest challenges thus far in 2015. 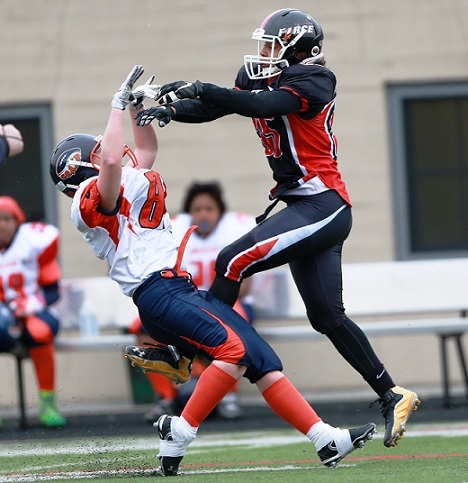 Saturday’s game vs the KC Titans is a cross-conference game between two perennial playoff teams and will have significant impact on playoff seeding. Kickoff is 5pm on May 16th at Lane Stadium.